I have a small dilemna here. I wanted to buy WindowBlinds 7.2 with an Online Computer, but install it on an Offline Computer. I sent an e-mail to Stardock, and they told me to use Impulse. So I downloaded and installed onto the Offline Computer, but it says to login with E-mail and password. This requires Internet, and now I am really confused...What do I do to download Online but activate and use Offine? Any help is appreciated, any sort of alternate Activation, or some explanation of how Impulse is going to help in this situation, which I don't see how it will. !. Use the Impulse method for your online computer. 1. 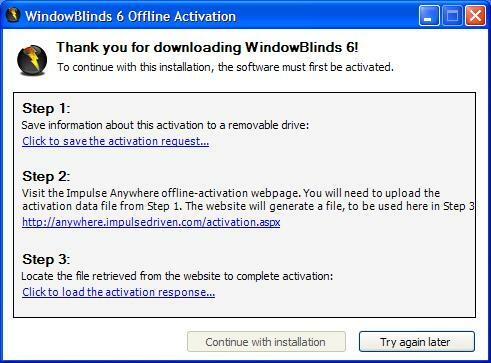 Purchase WindowBlinds 7.2 from the Impulse Anywhere store place, as judging by this screenshot. 2. 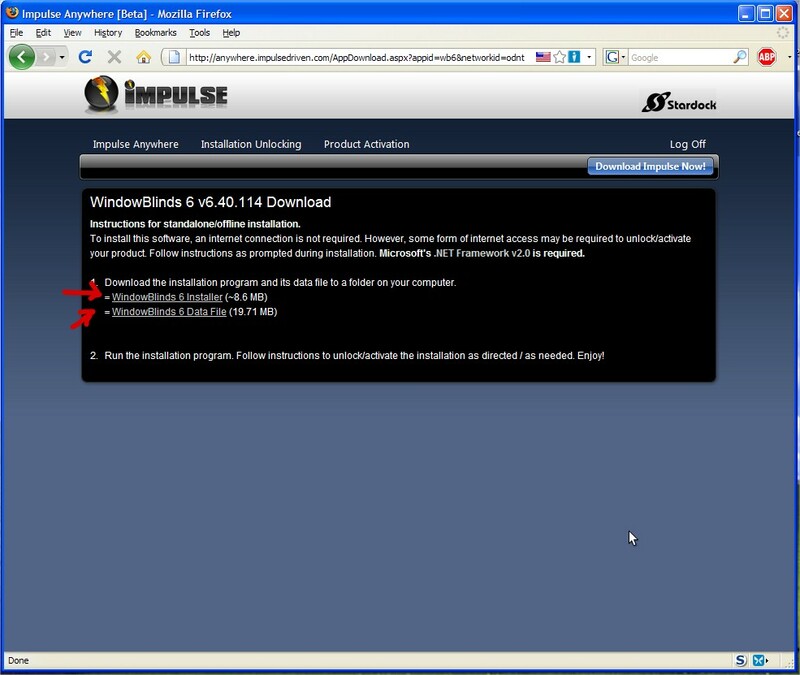 Install Impulse anywhere on the Offline computer, then install WindowBlinds 7.2. [Should I install through Impulse, and does it matter if Impulse is on the Online computer or not, as it is not getting anything installed? 3. Then see this screen, and follow instructions to activate? [Is there the same screen for Impulse Anywhere for WindowBlinds 7, as this screen was taken from WindowBlinds 6?] Am I correct? Thanks for the help, your post pretty much cleared up most of my questions. If you're only installing it on the offline computer, you won't need Impulse. Just use the files from Impulse Anywhere, and follow the instructions it gives you. And that should be the same screen for WindowBlinds 7 as it was for 6. Thanks Rosco_P and DrJBHL, I now have WindowBlinds 7.2 installed and am very pleased with the result.